PLEASE NOTE: I work with (and am only allowed to work with) institutional investors. If you are a professional money manager, but are not yet a client, you should go here first. And if you aren't a professional money manager, I regret that I can not, by law, make my service available to you. "An End... And A Beginning"
Here is my retirement announcement. My post-retirement business plan is here. And my final memo from December 31st, "Putting Things Into Long-Term Perspective", is here. We've added a list of the financial blogs we follow (there are only six of them) to our Reference Material section under the Charts-Links button (below). "A Way Forward" and "Unconventional Clues"
My old friend Dean LeBaron got two of us to help him write an article last December for a financial academic journal on how we got into this financial mess and, especially, to "goad discourse forward" on how to get out of it. The article proved to be too unconventional for the journal (among other things, they didn't like the fact that things like the Kondratiff Wave couldn't be described via a precise mathematical formula with lots of Greek letters in it), but you can read it here. In the meantime, Kate Welling, who writes a widely-followed and highly-regarded publication at Weeden for professional investors, picked up on it and interviewed the three of us. The result of that interview was a really neat (and very readable) piece in which we were much less statesmanlike (and, because of Kate's prodding, were forced to venture more conclusions than the article, which was designed to "goad discourse", contained). The interview was published on January 23rd, 2009, and Kate has graciously given me permission to post the article here. When we submitted "A Way Forward" to the scholarly journals they critized us, in their rejection letters, for using the Dow/gold ratio as an equity deflator rather than the CPI. Mark Ungewitter, with help from Dean LeBaron and minimal help from me, superbly defended our use of the Dow/gold ratio and expanded our analysis of it in a November 2009 article "The Real Deal". You can read it here. My thoughts at various points in time -- as recorded by unbiased journalists. I was interviewed along with Marc Faber, Jim Rogers, and Jeremey Siegel. You can read the interview here. You can read my February 28th, 2005 Barron's interview, "The Prince Of Tides", here (subscription to Barron's Online required). "It is his custom to blush, not boast. And he is as preoccupied with the health of his orange and grapefruit trees as he is with the state of the stock market. A sensitive man, indeed, is Walter Deemer. 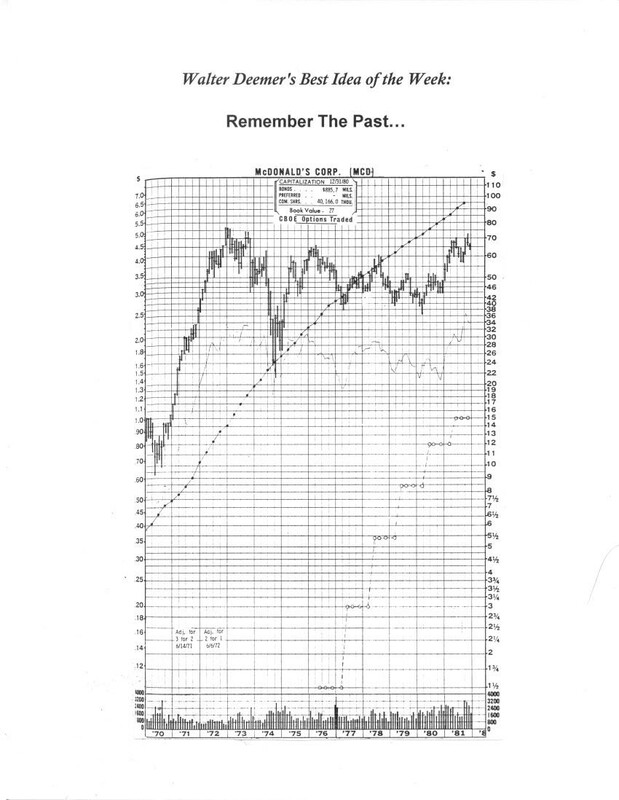 For 40-some odd years, this master of the delicate art of studying stock-market cycles has applied himself with singular devotion to understanding the secrets contained in such things as Fidelity sector funds, the relative-strength of various industry sectors as well as the habits of a certain species of speculator all in pursuit of the best possible strategies to position institutional portfolios. Deemer is now following his lifelong pursuit from his riverfront home in Port St. Lucie, Fla., where he is his own boss at DTR Inc., sending his daily updates and special memorandums via e-mail to fans made loyal by his ability to get them in and out of the market at critical market junctures. It is a talent he has demonstrated year after year and decade after decade from the time he was an apprentice to Bob Farrell at Merrill Lynch in the early Sixties, through his time with Gerry Tsai at the Manhattan Fund in the late Sixties, through his tenure as head of market analysis at Putnam Investments during its heyday in the Seventies. For his sense of things now, please be our guest." You can read my February 23rd, 2004 Barron's interview here (subscription to Barron's Online required). The explanatory material for the charts in the article can be found here (under the "Reference Material" heading). Ian McAvity's "Busted Bubbles" chart is here. Finally, the McDonald's chart from the 'Seventies and early 'Eighties is here. I got the following absolutely unsolicited comment from a client during the storm in 2008. I don't usually mention things like this ("It is his custom to blush, not boast"), but decided to make an exception this time. particularly helpful to me to have a sense of both broad direction and sector advantage." "Walter Deemer, considered by many of us the most solid of market technicians/strategists..."
"We get tons of data... but there are very few people that can give us the seasoned insights that you do." I was honored to be selected as the featured technical analyst in Dean LeBaron's recently-republished "Dean LeBaron's Treasury Of Investment Wisdom; 30 Great Investing Minds", joining such luminaries as John Bogle, Peter Lynch and George Soros as the chosen "guru" in their field. I was interviewed in 2008 by Jasmina Hasanhodzic, an MIT grad student as part of a project which seeks to introduce new quantitative approaches to technical analysis and highlight the ways in which technical analysis is used by some of its most experienced practitioners. Excerpts from the interview are included in a book co-authored by Jasmina and Andrew Lo titled "The Heretics of Finance: Interviews with Leading Practitioners of Technical Analysis" that was published by Bloomberg Press in January 2009. As 2003 began we were awaiting confirmation that the market had launched a new cyclical bull market and was not staging just another bear market rally, as we discussed in our January 3rd memo "The Market Should Go Up In January. (It Had Better!)" Even more unfortunately, we never got that confirmation in January, and we turned bearish at 922 in the S&P in our January 15th Daily Update -- ultimately targeting 785-790 in the S&P as our "longer-term downside objective". The S&P, in one of those "happy coincidences" that have dotted my 39-year career, rallied from an intraday low of 788.90 on March 12th; the next day, we issued what proved to be an especially timely memo,"Gor Blimey; It Looks Like A Bottom!" The March 12th low also made our memo of the preceding Friday, "We're Due For A Cyclical Bull Market!" an even happier "coincidence".